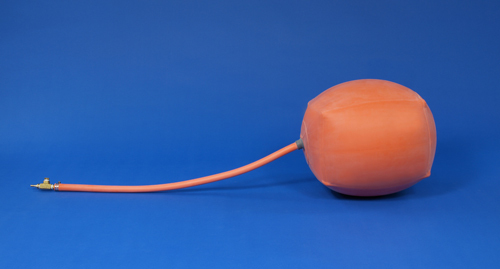 Rubber Color - The color of the actual rubber used in the manufacture of Perma-Type's Natural Rubber Type "NRB" inflatable pipe plugs has changed to a "Safety Orange" color. Please note that this color does not affect the usefulness of these plugs in any way. NOTE: "NRB" PLUG SHOWN WITH FITTING FOR ILLUSTRATION PURPOSES ONLY. PTORNRB02 2 51 12.6 C.I. 4 1.50 36" 0.25 5.75 oz. PTORNRB03 3 76 35.3 C.I. 5 2.25 36" 0.25 6.75 oz. PTORNRB04 4 101 75.4 C.I. 6 3 36" 0.25 8.25 oz. PTORNRB05 5 127 137.4 C.I. 7.25 3.5 36" 0.25 9.25 oz. PTORNRB06 6 152 226.2 C.I. 8.75 4 36" 0.375 13.50 oz. PTORNRB08 8 203 452.4 C.I. 11.5 5.25 36" 0.375 13.75 oz. PTORNRB10 10 254 863.9 C.I. 13.5 6.50 36" 0.375 15.75 oz. PTORNRB12 12 304 0.91 C.F. 18 8 36" 0.375 1.75 lbs. PTORNRB14 14 355 1.4 C.F. 19.5 9 36" 0.625 3 lbs. PTORNRB15 15 381 1.7 C.F. 20.5 9 36" 0.625 3.50 lbs. PTORNRB16 16 406 2.1 C.F. 24.25 10.50 36" 0.625 3.75 lbs. PTORNRB18 18 457 2.8 C.F. 25 12 36" 0.625 4.25 lbs. PTORNRB20 20 508 4.5 C.F. 30 13 36" 0.625 4.50 lbs. PTORNRB21 21 533 4.8 C.F. 31 14 36" 0.625 4.50 lbs. PTORNRB22 22 558 5.5 C.F. 32 15 36" 0.625 4.75 lbs. PTORNRB24 24 609 7.1 C.F. 34 15.50 36" 0.625 6.50 lbs. PTORNRB26 26 660 9.5 C.F. 39 17 36" 0.625 8.50 lbs. PTORNRB28 28 711 11.4 C.F. 40 19 36" 0.625 8.75 lbs. PTORNRB30 30 762 13.9 C.F. 43 20.50 36" 0.625 9.50 lbs. PTORNRB32 32 812 16.8 C.F. 43 20.50 36" 0.625 9.50 lbs. PTORNRB34 34 863 19.9 C.F. 43 20.50 36" 0.625 9.50 lbs. PTORNRB36 36 914 24.7 C.F. 54 25 36" 0.625 14 lbs. PTORNRB40 40 1016 35.6 C.F. 54 25 36" 0.625 14 lbs. PTORNRB42 42 1066 42.5 C.F. 67 29 36" 0.625 20.50 lbs. PTORNRB44 44 1117 47.5 C.F. 70 29.50 36" 0.625 22.50 lbs. PTORNRB48 48 1219 58.6 C.F. 70 29.50 36" 0.625 22.50 lbs. PTORNRB54 54 1371 87.5 C.F. 82 36 36" 0.625 30.50 lbs. PTORNRB60 60 1524 114.5 C.F. 95 43.50 36" 0.625 43 lbs.